We have a vast range of Adjustable Pallet Racking (APR) to suit all types of warehouse storage needs. As the premier Storage Centre for Yorkshire and the North East, 2h Storage Solutions have expert knowledge built on years of practical experience in all industry sectors to help you maximise space utilisation, optimize material flow, ensure appropriate product access and to preserve the quality of the goods stored. We design, install and maintain warehouse racking for manufacturers, wholesalers, retailers and end-users. Our collaborative approach to storage installations range from straight forward to highly complex. However in every case, the quality of thinking, the attention to detail, the application of experience and knowledge is simply second-to-none. 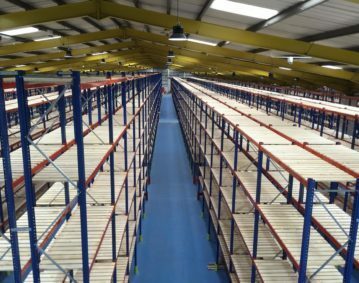 Whether you are planning a new warehouse, extending an existing facility or replacing a racking system there is a wide range of Pallet Racking products to suit your needs. Whether it is increased density or a change from first-in last-out to first-in first-out our team has the solutions. Adjustable pallet racking enables the safe storage of both palletised and non-palletised loads. They are cost effective, easily installed and a versatile system. With adjustable beams, this racking can be configured to accommodate changes in the type of goods stored Wide aisles allow access by all types of truck and makes loading and unloading an easy and efficient process. Our experience and knowledge is freely available to you. To take advantage of this wealth of knowledge please contact us today.